Looking forward to spending this long weekend around the BBQ? Mushrooms Canada has put together the ultimate grilling meal- Appetizer, Side Dish, Main Course- to satisfy those grilling cravings! Serve this very easy side dish with grilled chicken, fish, lamb or spinach vegetarian dishes or as part of an Asian menu. In a small bowl or measuring cup, combine the soya sauce, oyster sauce, honey and red pepper flakes; set aside. Heat a large wok or skillet over medium high heat; add the sesame seeds and cook, stirring constantly, for 1-3 minutes or until golden brown. Remove to a plate and set aside. Add the oil to the wok and heat over medium high heat until hot. Add the mushrooms and stir-fry for 1 –2 minutes or until starting to brown. Stir in soya sauce mixture and sesame seeds; stir-fry for 2-3 minutes or until mushrooms are well coated and just tender. Serve sprinkled with green onions if desired. This is a delicious and fast way to cook mushrooms on the barbecue while grilling steak, burgers, chicken or fish. Try crimini or a mixture of mushrooms for a change. Place sliced mushrooms in lightly greased foil pie plate or in a large rectangular piece of heavy foil. Sprinkle with oregano and top with cheddar cheese. Cover with foil and grill over high heat for 5-10 minutes or until bubbling and cheese melts. The flavourful sauce is mildly spiced, since green peppercorns are the under-ripe berry from the pepper plant and therefore not as hot as black peppercorns. This dish is utterly simple to prepare but special enough for entertaining. In a measuring cup mix oil, juice and garlic. Place mushrooms in a plastic bag and place chicken in another plastic bag. Pour half of the marinade over mushrooms and other half over chicken; toss to coat evenly; seal bags securely and marinate in refrigerator for 1–4 hrs. Just before cooking chicken prepare sauce according to package directions. Remove from heat and whisk in sour cream; set aside. Remove chicken and mushrooms from marinade and grill over medium-high heat for 4 minutes each side or until chicken is no longer pink and mushrooms are tender. While reheating sauce over medium-low, slice mushrooms; place chicken breasts on serving plates and top each with a sliced mushroom. Drizzle sauce over all. What are you grilling up this Civic Holiday? There really is no simple way to answer this. The growing mushrooms contains a lot of steps, and a mushroom farmer must go through a very lengthy process before those white button mushroom you love and enjoy are shipped to your local market. Let’s take a look a look at how mushrooms grow…. Contrary to popular belief mushrooms are not grown in manure. Mushrooms are in fact grown in a pasteurized substrate, which is made up of several different organic materials such as wheat, straw, hay, stable bedding, poultry litter, gypsum, corncobs, and high protein supplements such as soybean meal and feather meal. Each item does its job to create carbon & nitrogen, as well as manage the pH levels of the substrate. These items mixed together create a nutritionally balanced growth medium for mushrooms. Pasteurization of the substrate is next. This is the most important step in making the substrate as it eliminates any pests or micro-organisms that may be in the mixture. During pasteurization the substrate reaches a temperature of 160F/71C, all bacteria is killed. The substrate is now ready for the spawn (fungal seed) to be added. Mushrooms are “planted” using fungal mycelia instead of seeds. This “seed” or spawn is created in sterile, biosecure laboratories. Spawn making starts with a mixture of sterilized grain such as wheat, rye, or millet. Particles of mycelia are added to the sterilized grain and then incubated to promote the growth of spawn. Mushroom farmers then purchase this spawn mixture from the specialized commercial laboratories. Mushroom spawn is then mixed thoroughly with the pasteurized substrate back at the farm. Temperature and humidity is then managed to promote the mycelial growth within the substrate. The mycelia (a mushrooms equivalent to a root) grows in all directions throughout the substrate from the spawn grain. After this spawning takes place the substrate and spawn mixture is transferred to several hundred beds or trays. A layer of casing is then spread over the mushroom bed. This casing is usually about 2 inches thick, and is made up of mostly peat moss. This casing layer acts as a water reservoir and provides a place where the mushroom mycelia form thick white rhizomorphs, which is what happens when mycelia grow together (it looks like white string). Because mushrooms need moisture, water is applied right after the casing. 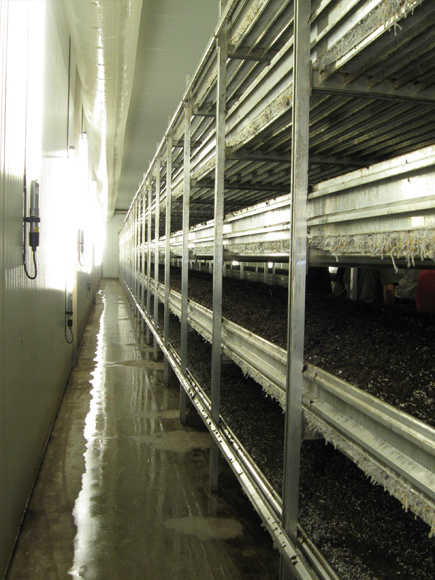 The beds are then watered periodically to the maximum holding capacity of the casing layer. In a few weeks the mushrooms will be ready for their first harvest. Mushroom growers can often get more than one harvest from their single crop. Some can do two or three harvests with a 7 to 10 day break in between each harvest. The mushroom yield will decrease with each harvest of that single crop. 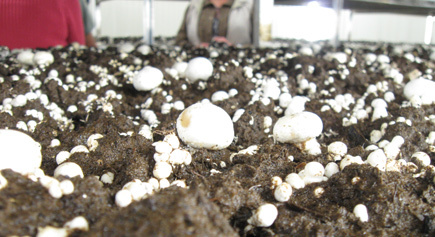 Agaricus mushrooms are harvested for 16 to 35 days. During this harvest time bed temperatures, humidity and air ventilation are all controlled and monitored to ensure a healthy crop. All mushrooms are hand harvested, which is very labour intensive work, believe me. After picking the mushroom from the bed the harvester then cuts off the base of the mushroom or the stump. The mushrooms are then immediately put into cold storage, this stops any mushroom deterioration or browning. This is also why you should keep your mushrooms in the fridge when you take them home. The mushrooms are then sent to packaging where they are either washed, sliced or cello wrapped in trays. Each package is weighed and then sent under a metal detector to make sure that no foreign objects were dropped into the container. They are now ready to be shipped. The mushrooms that you see in your local grocery store were most likely picked 12-24 hours ago, so when you get them, you are getting the freshest mushrooms possible. So there it is, the answer to every ones burning question, how mushrooms really grow. I hope this helps out all the people who have ever wondered. In this last post of this Feature Friday Series, we are exploring one of the newest Canadian grown mushrooms, the King Oyster. Description: King oyster mushrooms have a light tan cap with a thick white stem. Taste: This stout, thick fleshed mushroom is pleasantly chewy top to bottom and has the advantage of remaining firm when cooked. The flavour contains a delicate taste of woodsy and sweet. Uses: This whole mushroom can be eaten. Adapts well in French, Italian, Mediterranean and Chinese cuisines. It stands up to sauteing, stir-frying, and grilling, becoming golden brown and nicely crisp. King oyster mushrooms have a very similar growing process to enoki mushrooms. You can read about that process here. 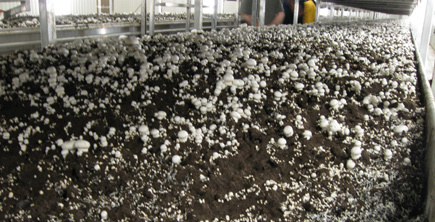 For the growing process in pictures visit Enviro Mushroom Farm’s website here.